Welcome to Adventurous Gypsy Safari, please find complete information on online jeep safari and canter safari in Corbett National Park. Corbett National Park allows day visit safari two times in a day and there is a time schedule of morning and evening. There are only 30 open jeeps, which can be permitted at any point of time. The five popular zones for Gypsy safari inside Corbett Park is the exciting way in which you can swindle inside Corbett National Park on Gypsy. Your tryst for exploring flora and wild life in their natural habitat will be realized through Gypsy Safari in Corbett Gypsy Safari in Corbett Park are Bijrani, Jhirna Corbett Landscape, Dhella and Durgadevi. Visitors can book online Gypsy Safari or Canter Safari for five different zones of the park namely Bijrani, Jhirna, Dhikala, Dhela and Durgadevi. 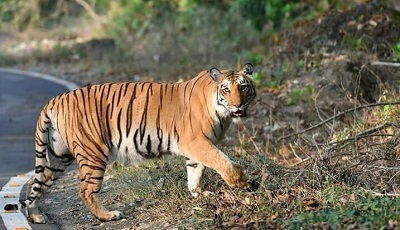 During winters, corbett jeep safari is well-known for bird watching, whereas during the summer seasons, the tourists can take a clear and easy glimpse of herds of elephant, tigers and other wildlife through safari route canter or Gypsy Safari in dhikala Zone with overnight stay at dhikala of Corbett National Park. All the procedures of safari booking inside Corbett National Park and stay inside the dhikala and other forest rest house lodge are managed through automated computerized system to ensure the equal distribution of tourists by the forest department and difficult to influence. Availability of zones, Jeeps, jeep driver and the naturalist guide are also registered with park authorities. You can make online jim corbett safari booking, online corbett jeep safari booking, online jim corbett forest lodge booking, online corbett elephant safari booking, online dhikala safari booking, online dhikala jungle tour packages booking, online corbett forest resort booking, corbett online jeep rental, online corbett motel booking, Corbett National Park india, online jungle safari booking, Corbett National Park booking, corbett tiger reserve accommodation, online jim corbett resorts, hotels booking, online dhikala forest rest house booking. We are bound to follow the same rules and regulations which are directed by The Corbett Tiger Reserve & Uttarakhand Government. The source of the data & information relating to Corbett National Park is the official website of Corbett tiger reserve India. No Gypsy other than registered and allowed by park administration is allowed to enter inside the park.